At the end of July the operator cancelled the 90 service between Lowestoft and Southwold and the cessation of the 7 route between Great Yarmouth and Norwich with sister company Konectbus taking over. Anglian also extended the 61 to serve Great Yarmouth's Barrack Estate via Magdalen Estate. It also withdrew the 82 Beccles Town Service and the 80 Diss to Beccles route under short notice. 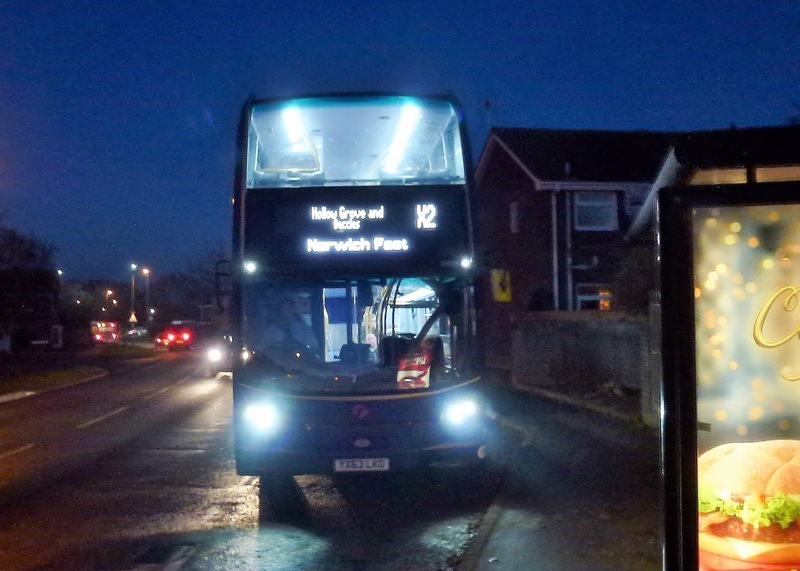 Following resident and stakeholder requests, Anglian introduced a new 81 service linking Belton and Bradwell with Great Yarmouth following First's removal of its 7 route for most of the day. However, the above changes and alterations in timetables means the operator's daily fleet requirement has reduced to just 28 vehicles. The year began with the remaining ex Jersey Caetano bodied Darts leaving Lowestoft for Cornwall with EG52EGF only making it as far as Ipswich where repairs were undertaken. At the same time former First Bath Darts arrived in the Suffolk town to replace them. Meanwhile, over at Great Yarmouth the first of the Olympians to leave Caister Road for scrapping saw W432CWX collected by Alpha Recovery in early January. This left W434/5CWX languishing in the rear yard awaiting the same fate but W431CWX returned to Bernard Matthews duties in the same month. It faltered on a few occasions and was finally withdrawn in early February with a twisted chassis. All three made their final journey in May following collection by Alpha Recovery. March saw the operator selling its two Routemasters JJD480D and NML623E to Bus & Us of Briston in Norfolk and Dawson Rentals respectively - with the later being exported to Dublin. some of the Presidents moving to Norwich (for transfer away within the First Group) Great Yarmouth gained Tridents LK51UZE/T, LR02LXK for a short period starting in April with LT52WUX following in May. Further arrivals on loan in June included Ipswich heritage liveried Transbus AU53HJV and Wright Eclipse Gemini BD11CFX from Norwich. A surprise addition to the fleet was South Yorkshire's Trident X611HLT, which didn't stay too long prior to moving on! Talking of the summer months, First Norwich Gemini's BD11CFV/CDZ appeared in June on loan to cover the summer period. Specially converted open top Trident W905VLN arrived in the following month in its new Seasider livery for the seasonal 3 route - although it did have its moments! In late July Konectbus began running a new 7 Monday to Saturday Norwich to Great Yarmouth route - replacing that provided by Anglianbus. Some services started and ended at Caister on Sea and the service ran via the Postwick Park and Ride facility using the Park & Ride liveried Alexander Dennis Enviro400s. During late August Konectbus cancelled its 72 Norwich to Great Yarmouth Market Gates service. Stagecoach East operates the Coasthopper service in the northern extremity of our area and, at the beginning of October, I observed some of the six new Optare Solo SRs on the route in the specially commissioned Best Impressions livery. Previously employed Coasthopper branded Dennis Enviro200MMCs now see use away from the coast with some regularly appearing on the X29 route between Norwich and Fakenham. That's about it concerning our yearly reviews. All that remains is to wish you all a happy, healthy and prosperous 2017 as we head towards our seventh year of blogging. With the new year imminent, every year around this time we look back on the highlights of the previous twelve months and we first look at the independent operators. On the debit side, Plaxton Paragon bodied Volvo B12Ms KIG1857 (FN52HRM) and KIG1857 (FN52HRM) were dispatched to PSV Recycling of Hadleigh with the latter subsequently being offered for sale on eBay by Durham based Snowden Coaches. 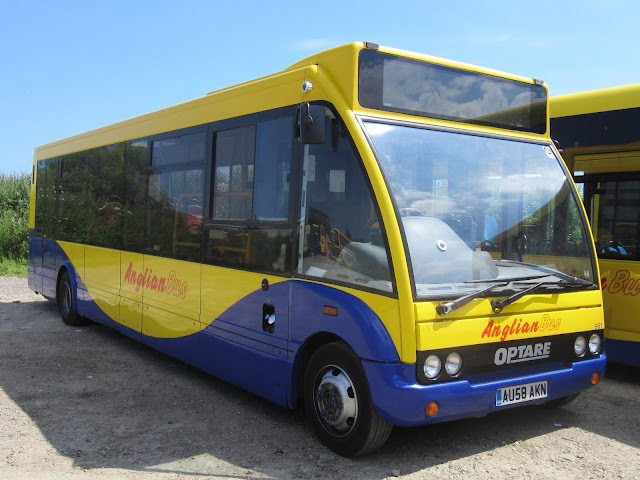 During the year three buses transferred within the Vistafield Group to sister company Semence with Optare Solos MX54KYB/C and Wright Axcess Floline S350SET heading west. Operationally, Ambassador secured the tender for the 68 Rackheath to Great Yarmouth Colleges contract although they ceased the Wednesday only 577 Chedgrave to Great Yarmouth service from the end of August. Another Vario left the Suffolk fleet in the form of SJI9076 (AE05MZN). Others departing included Setra NJI9245 to Paynes of Offord Cluny and Caetano bodied Toyota Coaster BV08VBK. This busy operator returned Alexander Dennis Enviro200 MX12DYO off loan in January following the arrival of similar BB11BUS (ex YX11CSV). Another of the type, YX09HZH, arrived from Ensign during September. In partnership with Simmonds, BorderBus introduced a new Waveney Line service with the latter providing the 580 Bungay/Beccles to Great Yarmouth section from mid August. An interesting development was the use of a decker on the first service of the day from September. Also taken on was the Beccles Town service from Anglian. This Catfield operator disposed of their Plaxton Paramont bodied DAF SB ORY640 in late June. It had been owned by the operator since August 2010. Aylmerton based Marret's Chariots took delivery of a new Mercedes BenZ Tourismo in January bearing the registration BG65VXU. 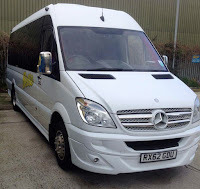 Our Hire, trading as Our Bus, registered a number of vehicles on eBay as being available for disposal during the year. They included DAF N482CEG and Alexander bodied Volvo B10BLE VAG608R which was later by destroyed fire. Newcomers were Optare Solos MX58AAY and CN54HFD. The former, with CN05JYP, were noted in July specially labelled up for the seasonal 300 Shoreliner service running between Vauxhall Holiday Park and the Great Yarmouth Seafront. Three new routes were registered to operate from August. They were 85A Rockland to Loddon, 86 Beccles to Poringland (ex Anglian operated) and the 271 Hemsby Beach to Great Yarmouth. However, the BL1 Roys of Wroxham to Stalham and the 290 Wroxham to Horning routes were abandoned in August and September respectively. Reynolds purchased a new Mercedes Benz Tourismo GR16REY during the summer and named it Lady Grace Esme in honour of Charles Reynolds' mother who passed away in February this year. More Plaxton bodied coaches arrived during the summer - Dennis Javelin YD05DFY in June and AT55CZH/J during August. Dennis Javelin BIG8773 was advertised as being available for disposal in September and later in the month Grahame noted it on trade plates ready to leave the Ormesby Road depot. Following the loss of most of their schools contracts, this Earsham based operator sold six of their vehicles at auction during July resulting in the closure of the business at the end of the month. This Holt based business acquired a number of buses and coaches during the period under review. These included a trio of ex London DAF Wright Geminis LJ53NHN/P/ and a couple of VDL/Berkhoff coaches YJ12CHK/X. As we walked along Brighton Road into town, the first bus seen was Stagecoach South's YN64XSJ, a Scania N230UD/Alexander Dennis Enviro400, heading for Brighton on the Coastliner 700 route. The return was via Marine Parade where National Holidays' Mercedes Benz Tourismo NH16CEH was laying over after a short run from Brighton - no doubt its occupants were taking a leisurely stroll as part of their tinsel and turkey tour! My thanks also go to Jamie Skinner, Colin Thorne, Colin White, Neil Chilvers, Tim Major, Syd Eade, Joe Leathers Watson, Chris Speed, Des Speed, Sheldon Rees, the late James Long, Rob Collins, SteveW, Kevan Portas, Robert Kelly, Tom Baker, Andy Dyer, Howard Smith, George Holland, David Warren, Steve Hewitt, Ross Newman, Graham Richardson, Jason Beverley, Paul Emery, Richard Woods, Simon Taylor, Ryan Durrant, Nicky Pursey, Zak Nelson, Zeus Wearn, Marcin Zarkowski and Sam Larke for their support too. My apologies to the many I may have left out but their help is appreciated much the same! Finally, eastnorfolkbus would like to wish all of its readers, supporters and contributors a very merry Christmas and a happy new year. Hopefully 2017 could be an interesting year too and we will endeavour to continue our high standard of reporting into our seventh year! Unfortunately I was unable to get there on time as my wife had a doctors appointment at almost exactly the same time! Isnt that just typical. After some thought, I contacted a resident of the parish to see if he was available to step in at the last minute and take some pics. 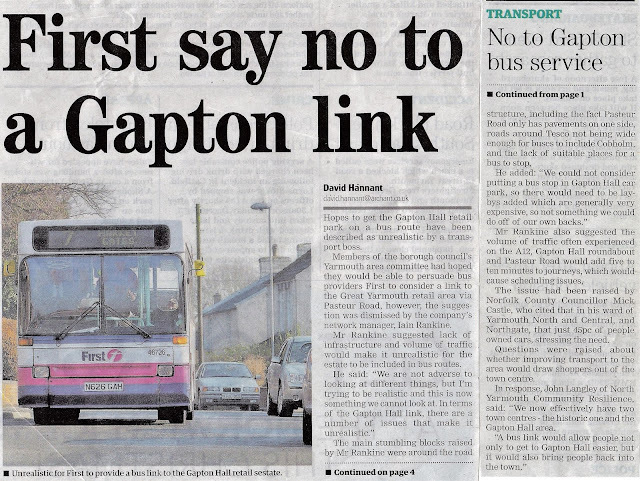 'I write in response to the article on the front of last week’s GYM regarding First's reluctance to run a bus to and from Gapton Hall. This an old chestnut for us in ENTUA. With the continued growth of this area we cant understand why one operator will not take a chance and divert one of their many Southtown Road operated services via Gapton especially with the growing number of large retailers now opening premises on this site. I hear what Iain Rankine is saying when he speaks of the problem with the traffic and particularly with the lack of infrastructure for buses in that area.We have debated this issue with Iain many times and ENTUA feels the with traffic situation on Southtown Road is just as problematic with queues happening along that stretch at numerous times of the day this is not a wholehearted reason not to consider a services. Also I am certain that once people became aware of the bus service it could end becoming quite a lucrative route! Friday's Great Yarmouth Mercury carried a front page story saying that First would not be introducing bus services to the recent retail developments situated to the west of the town - citing the idea as being unrealistic. Whilst it is constantly looking at ways to develop the local bus network, a service to Gapton Retail Park can not be provided due to the lack of adequate footways and the volume of traffic at the Gapton Hall roundabout. The Tesco store at Cobholm is also difficult to serve with roads being too narrow and the lack of current available areas for a bus stop. The Great Yarmouth Mercury's use of a photo of a 1995 Dennis Dart shows the lack of an up to date photo library!! In the latter case there appears to be the need for a more closer working relationship between the operator and the district council to reach a satisfactory conclusion for both sides. As regards the Great Yarmouth issue, more expensive road improvements are required to accommodate busses before any operators will introduce a service. Difficult to achieve in this time of austerity with council budgets being cut! The 70 route operates between Birmingham City Centre and Chelmsley Wood via Ward End (Fox & Goose Public House), Castle Bromwich, Water Orton and Coleshill. The Fox & Goose I remember really well as it was the regular watering hole for my brother in law!